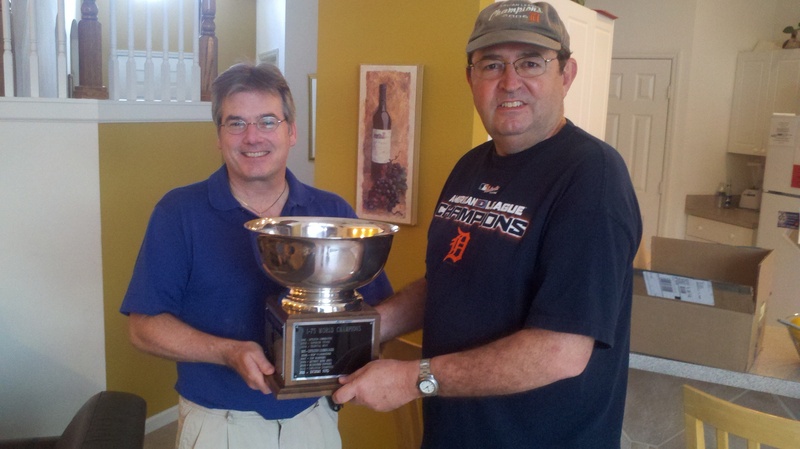 Commish Dave Renbarger, right, presents Hickory manager Mike Wilson with the I-75 League Cup for winning the 2011 World Series, prior to the 2012 season draft. The Hickory Nuts completed the most improbable run to a world championship since — well, since the 2011 St. Louis Cardinals — when they knocked off the Margaritaville Volcanoes in seven games to rule the I-75 League roost for 2011. Having finished a distant third in the Northbound Division, the Nuts’ postseason run included conquests of three consecutive higher-seeded teams, not unlike the 2011 Cardinals, a wild-card winner who earned their playoff spot on the last day of the regular season. It was the first-ever postseason crown for Hickory, which joined the league in 1991. Down 2-1 in the series to Southbound playoff champion Margaritaville, the Nuts scored back-to-back key victories, pounding the Volcanoes 18-2 in Game Four, then squeaking out a 7-6 win in 10 innings in Game Five on an RBI single by Kendry Morales. After Margaritaville forced a Game Seven with a 2-1 win in Game Six (both runs scoring on David Wright solo homers), the Nuts spotted the Volcanoes a 3-0 lead and came back to win 9-4. A four-run sixth inning swung the tilt in Hickory’s favor. Hickory had earlier defeated second-place Bushwood and first-place Superior in playoff battles. The seven-game win over Bushwood included road victories in Games Six and Games Seven. The win over Superior took six games, including a bounce-back from a 2-1 deficit. The regular season ending was marked by drama and controversy. In the Southbound Division, Applegate and Savannah were forced to a one-game playoff when both clubs tied with 75 wins. Down 3-0 in the eighth inning, Applegate scored four runs with two outs to take a 4-3 win and gain the final playoff berth. Wisconsin’s Southbound Division title was stricken when it was found that the Warhawks used ace Roy Halladay eight times in the month of September, pitching him in Games One and Five of every series, thus not allowing him the required amount of rest. In the resulting playoff game for division champion, Wisconsin defeated Margaritaville 5-4. Another milestone moment occurred during the season when Ken Kuzdak, a league founding manager, dropped out in midseason. His team was managed for the remainder of the year by John Renbarger and Ken Crawford, both of whom would be added to the league managerial roster for 2012, as the league voted to expand to 15 teams. Also joining the league are Steve Nieroda and Rick Lackey. A busy offseason was marked by a dispersal draft of the Detroit Demo Dogs, followed by an expansion draft and finally the usual annual waiver draft. Congrats to the 2011 league champion Hickory Nuts and manager Mike Wilson!!! Is the draft on Saturday, March 5th or Saturday, March 12th?